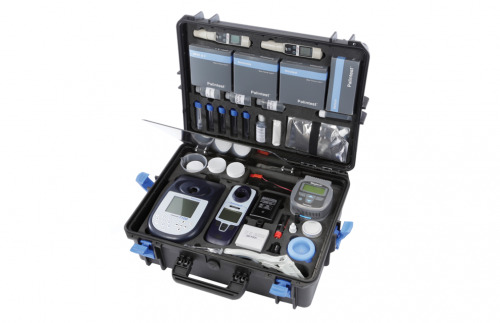 The single incubator version of the advanced Potalab kit, the Potatech features a complete set of digital instruments but remains lightweight and extremely portable for rural and remote water monitoring. Wagtech Incubator with standard test protocols and audible prompts, petri dish racks, high performance lead acid battery with capacity for at least five cycles per charge, mains charger with international adaptors, vehicle socket battery power lead, crocodile clip power leads. Polypropylene 250ml beaker, quick start prompt cards, sterilisable integrated work surface. Photometer 7100 and light cap, 6 photometer cuvettes, photometer reagents for 200 tests for free and total chlorine, ammonia, nitrite and nitrate. Compact Turbimeter, SDVB calibration standards, Turbimeter sample cuvettes (x4), silicone oil, cleaning/oiling cloth. Pocket pH Sensor and pH calibration buffers. Pocket Conductivity Sensor with conductivity calibration standard. Cuvette brush, dilution tubes (x2), crush/stir rods, De-Ion pack, instructions.